Maths week runs from October 13th-21st 2018. 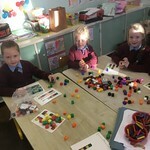 Each of the classes participated in lots of fun activities this week including playing larger sized Maths based games (Connect 4, Quoits, Noughts and Crosses, TinCan Alley, Snakes and Ladders, Jenga and Dominoes), Lego, puzzles, Maths trails, Scratch challenges, Maths themed Art lessons as well as online Maths games and activities. Click on the image below to see photographs of Maths Week..